With grilling season at the door, it’s handy having dependable marinades and seasoning rub strategies up your sleeve. I went to a potluck birthday party for my friend, Achla, who’s a fan of dishes redolent of ginger and garlic. I tried this recipe from Fine Cooking – heavy-handed with these flavors – and it was outstanding. This Asian-styled marinade has a thick, wet pasty consistency – more of a cross between a marinade and rub: a wet rub. As the recipe’s headnote suggests, this would also be a savory marinade for thick fish steaks, chicken, skirt steaks or tri-tips. Using a ginger-garlic condiment found in Indian groceries such as Bombay Grocers eliminates the need for the garlic cloves and hunk of ginger; I wish I’d had some on hand. This is a favorite condiment and adds easy zap to a multitude of recipes. Let steak sit 10 minutes, then slice into thin pieces against the grain. Flank steaks are great for entertaining. This lean cut of beef is delicious at room temperature and when sliced thinly, one is encouraged to savor a smaller portion, going lighter on the meat and enjoying the accoutrements. 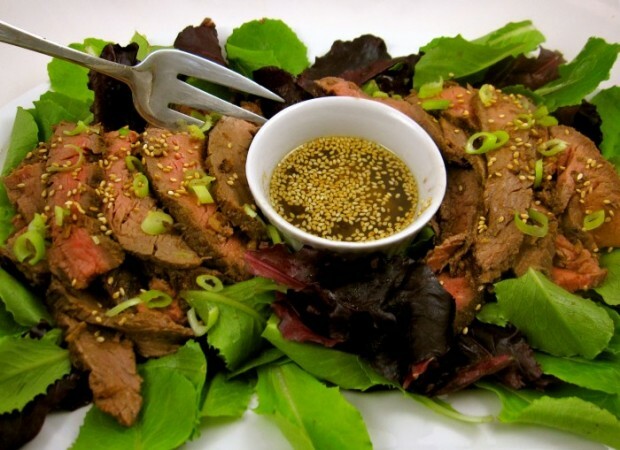 As in this recipe, you can load your plate with greens then top with a few thin slices of beef. There’s a certain decadence to eating meat. It’s hard to be immune to the statistical data; the destruction of rain forests for cattle grazing, and the unsavory, behind-the-scenes facts surrounding the factory-cattle industry. It’s also hard to forget that the juiciest steaks, those marbled in fat, top a cardiologist’s no-no list. That said, when my neighbor grills a steak, the smells release my carnivorous beast; I must follow suit. But these days my portions are smaller and I’m picky about the meat I choose to eat. Ann Arbor is full of options for purchasing humanely raised cattle, and most local butchers are happy to answer sourcing and cattle feed questions. 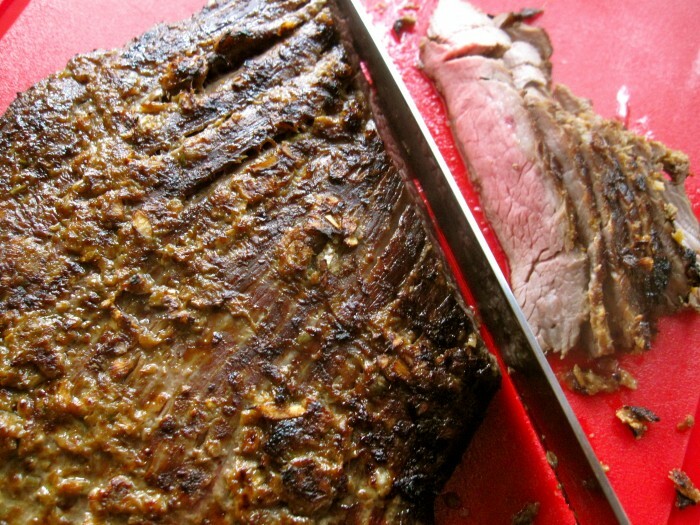 The large surface area of a flank steaks are ideal candidates for marinades. In the past, I’ve marinated these steaks in Southwest flavors and served them stuffed in tortillas. For a Tuscan approach, marinate them in balsamic vinegar, garlic and rosemary. Or infuse the meat with Thai flavors of peanut and coconut, then serve as a salad with shredded cabbage, cucumbers and carrots. The key to a great flank steak is a 12-24 hour marinade, and then cooking it quickly under a broiler or over a hot grill. I marinated the steak close to 24 hours, refrigerated, and I’m certain the lengthy marinade time boosted the flavor profile a great deal, and tenderized the meat. I would, however, only marinate thick fish fillets or chicken breasts 45 -90 minutes. I cooked this under a broiler but a grill would work fine. Flank steak is best served rare or medium-rare and if you prefer meat medium-well, I’d recommend selecting a different cut of beef. The following recipe was adapted from Lauren Groveman’s Ginger Flank Steak on Fine Cooking.com. Changes I made: I did not add extra salt, used 1 1/2 teaspoons of sesame oil, added sesame seeds to the dipping sauce and I marinated the meat 24 hours in the refrigerator. I also only scored one side of the meat and substituted red pepper flakes for ground black pepper. I served the recipe over mixed greens. Place garlic and ginger in a food processor and pulse until thoroughly chopped. Scrape the sides with a spatula and add scallions, 3 tablespoons peanut oil, 1 1/2 tablespoons soy sauce and 1 teaspoon of the sesame oil. Process until thoroughly combined and pasty. Season to taste with red pepper flakes. With the tip of a sharp knife, score one side of meat in a 1/4-inch deep diagonal crosshatch pattern, against the grain. Place meat in a non-reactive dish (or gallon-sized plastic bag with a secure seal) and rub marinade into both sides of meat. Marinate 12-24 hours refrigerated. When ready to cook, remove meat from the refrigerator and allow to come to room temperature. Preheat broiler in oven and position rack as close to heat source as possible. Broil 4-5 minutes on each side for rare to medium-rare. Let steak sit 10 minutes before slicing into thin, diagonal strips against the grain. Make a dipping sauce by whisking together the remaining peanut oil, soy sauce, rice wine vinegar, 1/2 teaspoon sesame oil and 1/2 teaspoon sesame seeds. Sprinkle beef with reserved scallion, remaining sesame seeds, and serve over greens, if using. I wanted to distinguish what can refrain from a bee in entire’s moving spirit so that’s forth it not who could not offer an true answer.